Stuff I've made; Tapdox, Waiting Room, BSEligibleKit, Millionaires Club, and Soule Mobile. Yesterday I gave a talk on mobile A/B testing at the Silicon Valley iOS Developers meetup at Yahoo HQ. I demoed the composition and testing of a test that would show a minimalist signup page 50% of the time, and a fancy one the other 50%. Then we inserted Mixpanel conversion events that would track the success of each respective group. I used Skylab to present the tests to users, and Mixpanel for funnel analytics. I'd also recommend using Ground Control to enable and disable the tests remotely. A/B Testing is your chance to try crazy new things on a limited but targeted scale. HT @BrianSoule for examples at #SViOS. You may have noticed more and more websites using facebook as a primary login method. Not only is it a quicker login process, but the use of facebook identities cuts down on spam and trolling. Facebook, and the web is changing. Facebook is becoming the foundation of a formerly anonymous internet. Where previously, facebook facilitated interactions between members on it's internal pages; Today, facebook will enable third party social interactions, and access to third party nonsocial utilities & productivity apps. As facebook moves toward hosting the entire internet upon it's social graph, and as your data is accessed by applications on a daily basis, it's days as a private, intimate, network used to share drinking pictures and inside jokes is coming to an end. This is not necessarily good or bad, it's just different. Conversely, I believe the market is creating an opening for a more intimate, exclusive network. One that would be optimal at around ~30 of your closest friends. A network that adheres to the social gatherings and parties that your relationships are originally derived from. 3.55 The 2010 federal budget in trillions of dollars. 37% The average midterm voter turnout percentage. $82,983 $3,550,000,000,000 / 231,229,580 * (1/.37) * 2 years = The approximate dollar value of your biennial midterm vote. Smiley Media is number 168 of Inc.'s 500 fastest growing private companies, achieving 1,126.3% growth from 2005-2008. I'm grateful to have experienced such breakneck growth. During my high school years, I made some fantastic friendships that continue to this day. It continues to amaze me how many high caliber individuals I encountered in one location. This burgeoning alumni organization promises to provide a rich body of talent and camaraderie to all of it's members. If you would like to volunteer to help with these tasks, shoot me an email at brian (at) briansoule .com. Let me know how you can contribute to these tasks and I will make you an official part of the organization. After finishing writing Tip Science; I encountered an entirely new challenge, selling it. Without doing much research, I set up an account with Google Adwords, and created a sales page. The page did ok without any optimization, but being average is hardly the best strategy. After researching for a few weeks two resources rose to the forefront, a recorded seminar by the author of Guerrilla Marketing and The book Predictably Irrational by Dan Ariely. Guerrilla Marketing was written in 1983. In retrospect, most advice on cutting edge marketing I've been given over the years can be traced to that lecture. I will be posting a summary in the near future, so check for it on the blog page. The book Predictably Irrational follows studies in behavioral economics conducted by MIT's Dan Ariely. A very interesting read, I will be posting a summary on it too. So how will I change my sales strategies? I will expand Tip Science from a book to a training course; with a training checklist, progress calendar, forum membership, and a course guide. The price will increase to 49.95, and the course will be free for 30 days. The sales page will become a helpful questionnaire, instead of a self promotion. Stay tuned for the results of these experiments. It boggles my mind how the interconnectedness of today's world is expanding scalability exponentially. Novel industries have historically required global capital for global influence; in this day, an intangible software program can be distributed globally in only a few months. Though the reptilian brain still favors physical strength, the most powerful people on earth are surely mild mannered thinkers. Take a moment to fully appreciate your potential. What would you do if someone said that you could have a billion dollars, as long as you returned it after a year? Media talks about a few things when examining causes of the credit crisis 1. Under regulation 2. Greedy, over leveraged wall street investments. 3. Defacto government backing of risky mortgages. While doing some research of my own, I uncovered another factor that could have accelerated all three elements. It has to do with the fact that from 2003 to 2006, big players could borrow money for virtually nothing. This is a graph of Real Interest Rates for the last 40 years. Explanation: (Real Interest Rate = Interest - Inflation) Which means that if you lend your friend $1.00, he may agree to pay you $1.05 in a year. If the value of the dollar falls 5% due to inflation, then that $1.05 will buy less stuff now than your $1.00 could have bought one year ago. Essentially, you paid him a quarter of a cent to borrow your dollar for a year. That is what real interest rate measures. Now look at the graph. For about a three year period starting before 2003, real interest is below zero. This was essentially a period of free money. Institutions could borrow as much money as they wanted. How is this possible? 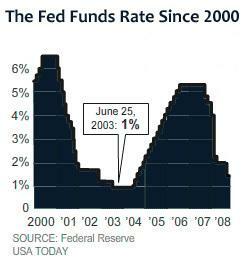 Here is a graph of rates set by the federal reserve. During the same period in the early 2000's. The fed dropped rates dramatically, letting real interest slide below zero and facilitating massive borrowing. Where was all of this money going? Real Estate. When the Fed dropped interest rates, money became free, that money went into real estate, and home prices increased. When the fed came to it's senses and raised rates, real interest moved above zero, firms could no longer borrow irresponsible sums of money, investors stopped throwing funds at real estate, and home prices started to plummet; causing a global panic, and a stock market spiral; while taking down commercial banks, AIG, Fannie and Freddie, and all six American investment institutions. And that is the cost of free money. Some say that the bubble had been in the works for much longer than that. Here you can see where Nixon decoupled the US currency from a gold backing. Without this backing, the government was able to print more money than it could pay back. This excess printing increases the quantity of money and therefore decreases its value. 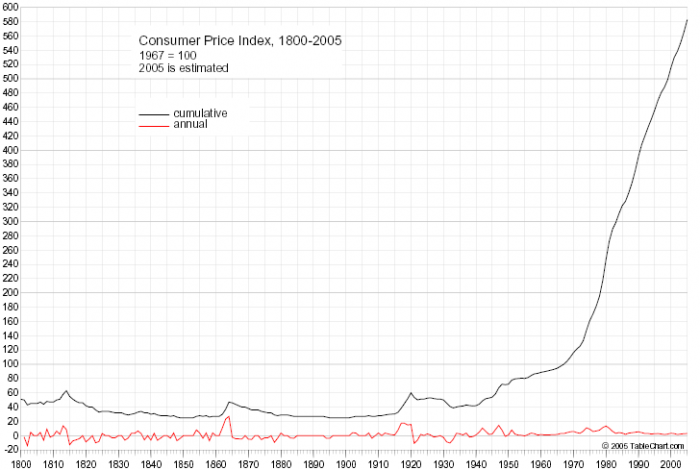 This trend is reflected in the consumer price index starting in the 1970s.